Peruvian Miners. 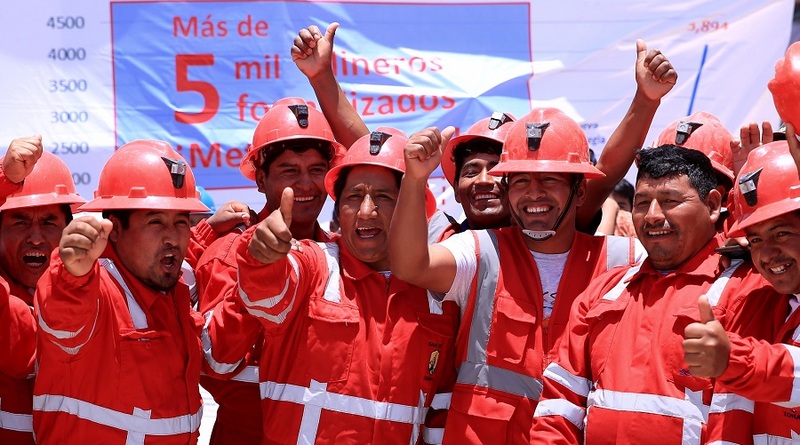 Photo by Peru's Ministry of Energy and Mines. The Peruvian Ministry of Energy and Mines announced today that it expects to reach $20.8 billion in investments between 2018 and 2022, with 10 per cent of such investments filling up the country’s coffers by the end of this year. In a press release made public by the state-owned Adina Peruvian News Agency, the government agency said the funds will be generated by three projects whose construction phase is almost done and nine others that are starting to be built. Next year, Lima expects to receive $2.9 billion in mining investments, which would represent a growth of 36 per cent compared to 2017. The country’s forecasts are based on the evaluation of projects that are in different stages, namely Anglo American’s Quellaveco copper mine, Jinzhao Mining’s Pampa de Pongo iron ore project, Chinalco Peru’s Toromocho copper mine expansion, Minsur’s copper oxide project Mina Justa, among others. Former Mining Minister Rómulo Mucho told Andina that, if all of these projects are able to move forward without major hurdles, Peru’s copper output could reach 3 million tonnes by 2021. Currently, the South American country produces about 2.4 million tonnes. Mucho also said that gold production could reach 180 tonnes by 2021.